The count down is officially on to Valentine’s Day. Fourteen days to go! We are still making little creations to send to Grandma and Gigi for Valentine’s Day. With some Valentine’s made with celery stamping, and some cozy yarn wrapped hearts already set to go, I thought we would make some non-heart valentines. So with a bunch of little busy boys playing inside and out it is nice to have a craft or quiet activity planned for the morning. You know, just as a little breather. Let them catch their breath (quite literally). 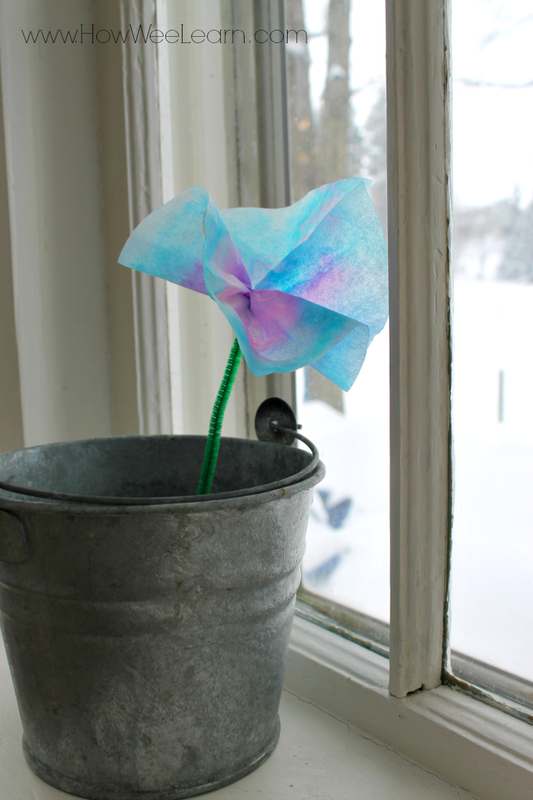 Today was our playgroup day and we made these sweet coffee filter flowers. You may have seen them before, they are quite cute. I made them with Madeline when she was 3 as a present for Nana, and we have been making them on and off since then. That’s a good 9 years! Yep, they are that good! Simple, fun, and very pretty. 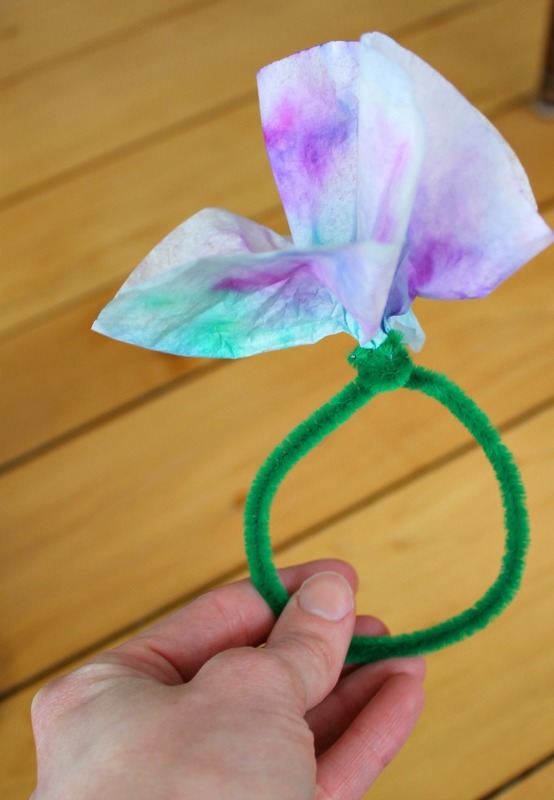 To make these coffee filter flowers, we simply took coffee filters and coloured them with washable markers. Some of the little ones coloured a lot, some just a little. Some with oodles of different colours, and some with just one. That is one of the greatest things about this craft — no matter how you do it, it turns out gorgeous. 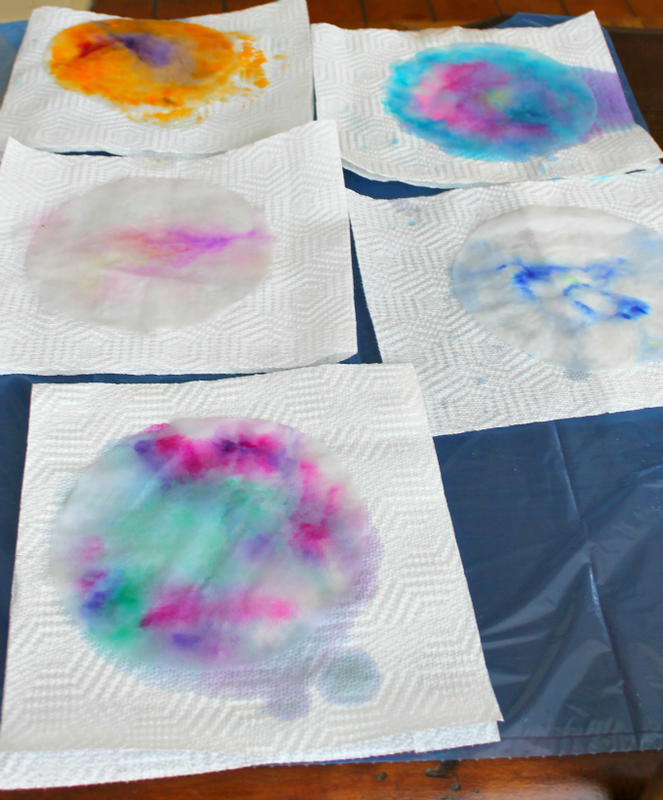 Once the coffee filters were coloured, we moved them to a plastic garbage bag and sprayed them with water. Not too much water is needed, just a few spritzes. However, these little ones really liked the spritzing part, so the flowers got a good dousing. Again – doesn’t matter, they still turn out gorgeous. We then moved them to some folded paper towels to let them dry. Already pretty! When they were completely dry, we attached a pipecleaner to the back of the flower. 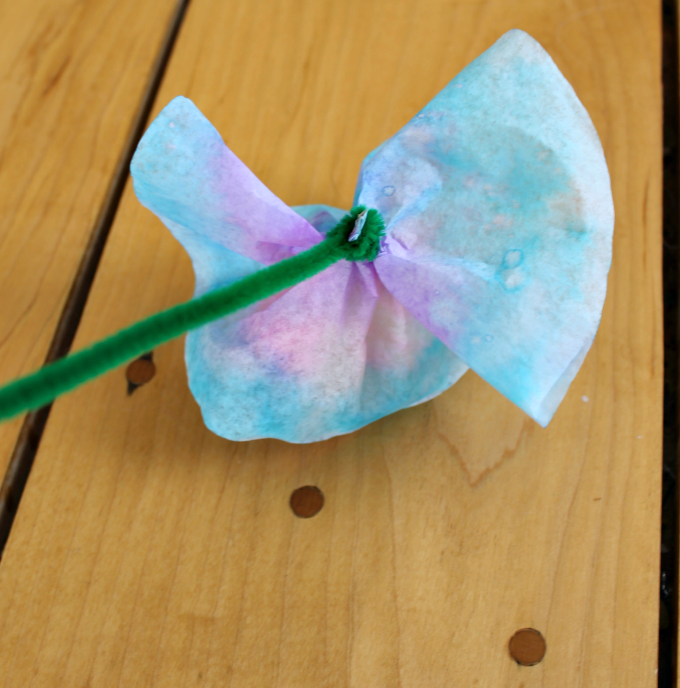 This was done by simply pinching the center of the back of the coffee filter and wrapping a pipecleaner around. Some of the boys wanted their flowers to simply have a long stem, and others wanted to wear their flowers like a bracelet. While I mentioned to the little ones that these would make lovely gifts for Valentine’s Day, I have a strong suspicion they will need to make some more for that to happen. I believe they might have been, “Happy Valentine’s Day to ME!” presents. And those presents are pretty awesome too. They look so pretty we might just fill up a whole vase to brighten up our kitchen. And then maybe for each bedroom too. They really are pretty, and add a lot of colour to the February grey. 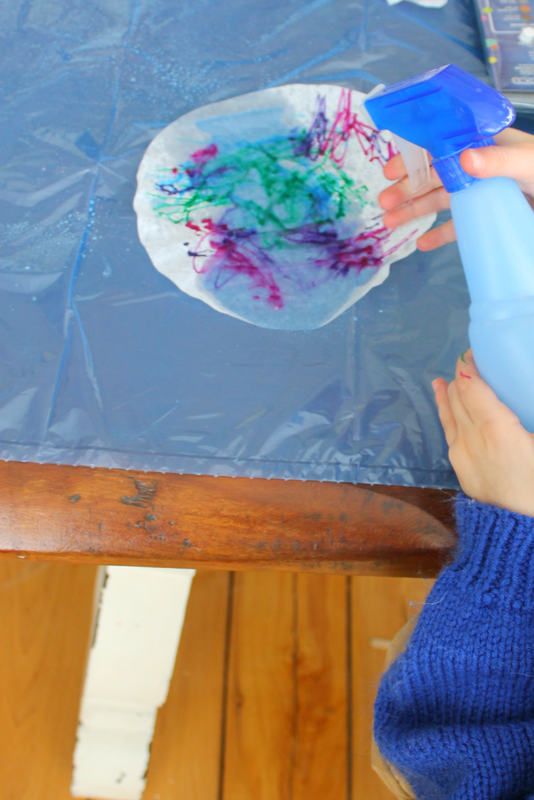 These are great crafts to make anytime of year. Mother’s Day, Birthdays, you name it! My lovely partners over at Oak Meadow are having their annual Valentine’s Day sale! 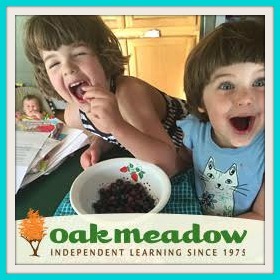 Pop on over to receive 20% off everything in the Oak Meadow Bookstore from February 14-28! Can’t wait for Sunday to make Valentine flowers. Every weekend my son arrives from the city, race off for an all-out ski while his almost two-year old stays with Grandma. We’ll begin outside with tubing, collecting dried flowers on the hillsides, then come inside for an art blast. Paint, water, colors flowing and mixing what joy is ahead. Maybe he will add a dried Queen Anne’s Lace to the centre of the coffee filter, pierce the paper and tie it all together with the pipe cleaner. A beautiful surprise for Mum when he arrives back home. And, Mum is relieved that her little one was occupied with a fun activity. Thank you, Sarah, for the creative inspiration you give to the extended family. Gives us a chance to awe everyone, as well as another way to share our love. Grandma M.
What a beautiful comment, and what a lucky family you have to have you!